It's already September and soon summer will come to an end. I try to enjoy all the locally grown fruits as much a possible. Each trip to the produce place I will haul back way too much fruit for the 3 of us but everything just look so good and I just can't resist it. We like to eat them fresh but there are times I like to bake dessert with them. Here is one of the dessert which I like to bake using summer fruits like strawberries, cherries, blackberries, blue berries and plums. Crostata is an Italian name for a free form tart baked on a cookie sheet rather than a pie pan. 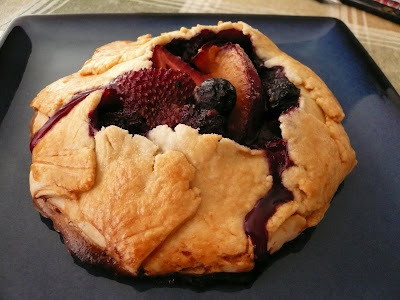 It's baked on a pastry with some fruits on the top. 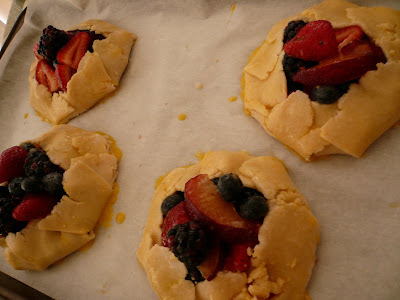 The side of the pastry is folded over the fruit filling to keep in the juices. To make pastry combined flour, sugar, salt in a mixing bowl. Add in butter and rub the butter into the flour with your hand until it resembles coarse bread crumbs. Add in egg yolk and pour in ice water. Bind the dough until it holds together without being too wet or sticky. Form the dough into a disk and warp in plastic wrap and refrigerate for 30 min before using. 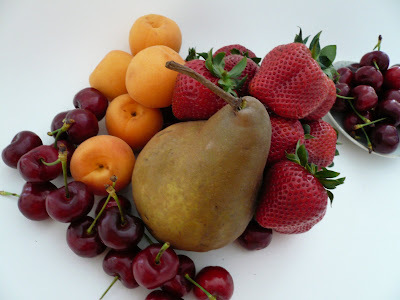 To make filling combined all the fruits, lemon juice, sugar, zest and flour in a large mixing bowl. Toss the fruits gently and set aside. Prepare a baking tray and line with parchment paper. Pre-heat oven to 350 degree F.
Sprinkle some flour on the counter and rolling pin and gently roll out the dough to about 1/4" thick. It doesn't have to be perfect as you want a rustic looking tart. Transfer pastry to the baking pan. Spoon the fruit mixture into the center of the dough leaving 2" border all around. Brush the border with some egg wash. 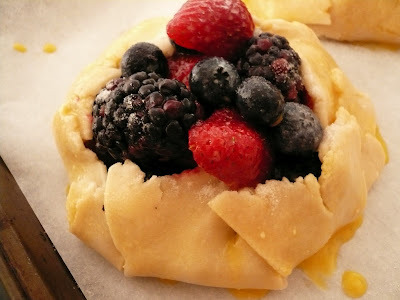 Lift the edge of the pastry to the filling leaving the fruit exposed in the center. Gently fold and pinch the pastry to seal any cracks. Brush the pastry with the remaining egg wash and sprinkle with sugar. 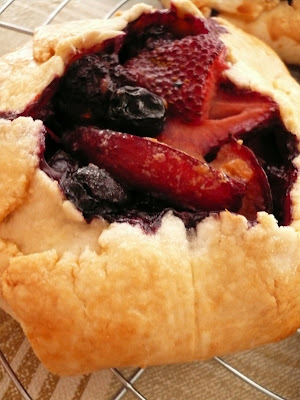 Bake crostata for 30-40 min or until the crust is golden brown and fruit is bubbly and tender. Remove from oven and serve warm or at room temperature on its own or with some vanilla ice-cream. Note : I made the crostata into 4 individual serving rather than a large one. You can add more sugar to the filling. You are killing me with those fruits tart. I love all type of berries and fruits tart is one of my favourite desserts. Wow, I'm in love with the second picture. Very colorful and great photography skill. Good job Gert. Please tell me you are moving to Virginia soon. wanna add something... all ur photos are incredible...very nice. i could make postcards with them. btw the pictures from your last post is so colourful. And so tempting too. Wish we have markets like those here. That is a real big egg plant and tomato. Envy, yeah you can make this into a savory tart. Beachlover, I have to do something about all the leftover fruits if not it will go into the tong sampah too. drNo, my neighbour is selling their house. Nak move here tak :) :)? I still have lots of pictures of the fruits. Let me know if you seriously wanted to make into postcard. I can e.mail it to you. Nonya, you are most welcome for a cup of tea. Yeah, the egg plant and tomato are really huge. Jun, strawberry season nak over soon so the fruits is much smaller now. 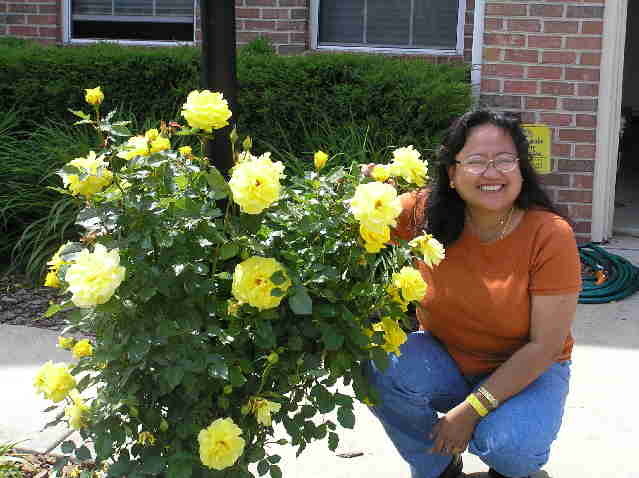 Pinky, want to buy my neighbour house? Wouw, Sedappp..and refreshing with various fruits. Nice shoots too! they look so tempting! its true about eating them fresh but one cant help it but to bake them of course, it'll give you a different "filling" alltogether. thanks for sharing this, will definitely try this next summer!! Gert, after seeing in person of your produce market, I don't blame you for carrying all kinds of fruits and vegetables home. They are so darn fresh and good prices too. I wish I was living close to that area. Your fruit tarts look good on that plate. Is that new? Zue, the blue plate is new. You saw our produce place. Sekali beli kena beli a big bag so susah nak habis. So kena find ways to finish all my fruits and veggies.